Fins (and Surf’s) Up for the Margaritaville Surf Team! A team made up of three talented sisters, these girls rip. 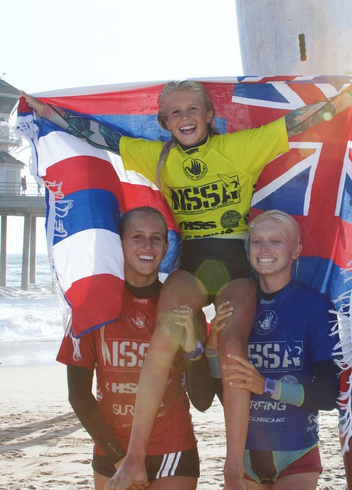 Mason, Lola and Scarlett call Hawaii home, but their passion for surfing and intense competitive schedule keep them traveling around the world. Between waves we were able to catch up with the team to learn a little more about the ladies behind the boards. Let’s get to know the youngest Schremmer girl, Scarlett! I started surfing when I was three years old. What’s your favorite thing about surfing or being on the water? My favorite thing about being in the ocean is riding waves and getting to be with my friends. Also, I love it when I see the turtles and rays in the ocean when I am surfing. My favorite hamburger is a burger topped with corn and ranch dressing. Where was the best sunset or sunrise you have ever seen? My favorite place to watch the sunrise is here on Oahu at Makapu’u Point. When you’re not surfing, what do you do for fun? I like to play golf. I also like to play basketball and learn to play the ukulele. Favorite place you’ve gone to surf or compete? My favorite place to compete here on Oahu is Turtle Bay. I would love to compete one day at Snapper Rock in Australia, because I love surfing that wave. What surfing award, accolade or accomplishment are you most proud of? One of my favorite contests is the Northshore Menehune held every year at Haleiwa. I won the girls 7-9 year-old shortboard when I was 8 years old. This year, I am most proud of being the 2017 Hawai’i State U18 SUP Champion and the USA U18 National Champion for U18 SUP wave riding.